How do you improve on what's probably the best game ever made? You make it bigger. Badder. More woman-slappier. 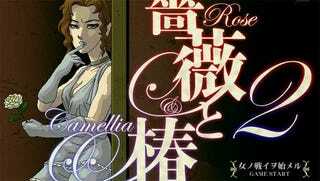 Yes, Rose & Camellia is back, this time as Rose & Camellia 2, featuring all-new ladies, all new stages and all-new woman-slapping action. It's great! So great there's a catch: you've got to finish R&C1 first (the shockwave version, linked below) to gain access to it. A little harsh, perhaps, but the bigger the reward the tougher the toil.